Regular updates are what blogging’s all about, but sometimes you want to keep hot topics or other static info at the top of your posts. This feature has existed as Sticky Topics in the forums, but hasn’t been available on blogs. Until now. Check that box, click Publish and — ta da! — your post is highlighted at the top of your blog, where it will stay until you decide otherwise. When your fresh stuff gets stale, just edit the post and uncheck the box. Click Save and it’s back to its place in chronological order. fantasticky indeed! this will be hugely useful. thanks! Very good, been waiting for something like this. Thanks so much. Going to go try out now. This is really cool, I used to do this by going to Settings and change the stuffs that makes my post static. Now that everything is easier and best of all, the posts goes back into chronological order. WordPress rocks. Finally! I have been waiting for this option. Thank you so much WordPress! Is this feature available as a plugin for self-hosted WP blogs? The feature is based on the WordPress plugin WP-Sticky. Very nice addition. When are you gonna implement the auto write post, so we won’t even have to write posts anymore. WordPress updates make blogging so easy, even g’dubya bush can do it! I like it too. Great Idea!!!! This is FANTASTIC! WordPress is the best Blog hosting company! wow! this was really needed..thumbs up! Magnificent.. thank you Word press. from the most creative Wor(l)dPress team there. It’s a good look – many thanks! Not sure when I will use it but it is such a good idea. Awesome job! This new feature will be very beneficial when you don’t want an important post to get buried. Thanks!!! Really good to see cool new features in WordPress so often! This is perfect! I have been using a “welcome page” with introduction and important updates which could now become a “sticky”. I had noticed that when I was previewing new templates to consider a change in look, that my Welcome Page was being deleted, so I have felt hostage to my current template – now I can make the sticky and move forward with updates. Very cool and appreciated! awesome, I was looking for this from a long time. What happens if you stick two or more posts? Will both of them got stuck, but still ordered chronologically? For the majority of themes, multiple stickies will show up chronologically. There are a few themes (Hemingway comes to mind) where 2 stickies at most will be shown. This is a great new feature! I bet I use it almost as much as I do Press This. Awesome news! And it works like a charm! That is brilliant, I will try it soon. Thank you so much. Some themes format new posts in the form of feature posts (IE: bigger font, etc. ), will this replace that function, or go on top of it? The sticky posts will display above. Also note: Monotone does not do anything special with a sticky post. The order of your images/posts will stay the same no matter how many posts you Sticky. well,that will be great any way ……cant wait for that . I have a few posts that are designed to have a lifetime of activity on my blogs. They have the kind of content that is dynamic and must be updated periodically. Now I don’t have to copy the entire post to return it to front page prominence. Wait, can you guys come up with some code that I can use to download a tinsy bit of your brain power? I sure could use some of that. Great! We will try it soon. I just saw this in my editor. Very happy this is finally an option. Thank you. That’s awesome! I’ll definetely use it, but is the post still viewable in chronological order while it is sticky? If you are on the blog’s front page, the post will only be shown up top as a sticky. If you are browsing through the archives, the post will be shown in order. This is a new great feature!Thanks. This is nifty. I’d like to see examples of creative ways bloggers use this feature! that’s excellent! I’ll have to make up some important sounding announcement so I can try it out. Great!, Thanks for the quick reply, much obliged. I have long awaited this feature. Thanks! I’ve got a special sticky which should not show up in RSS feeds. Hope this is possible? The RSS feed still respects the chronological post order. 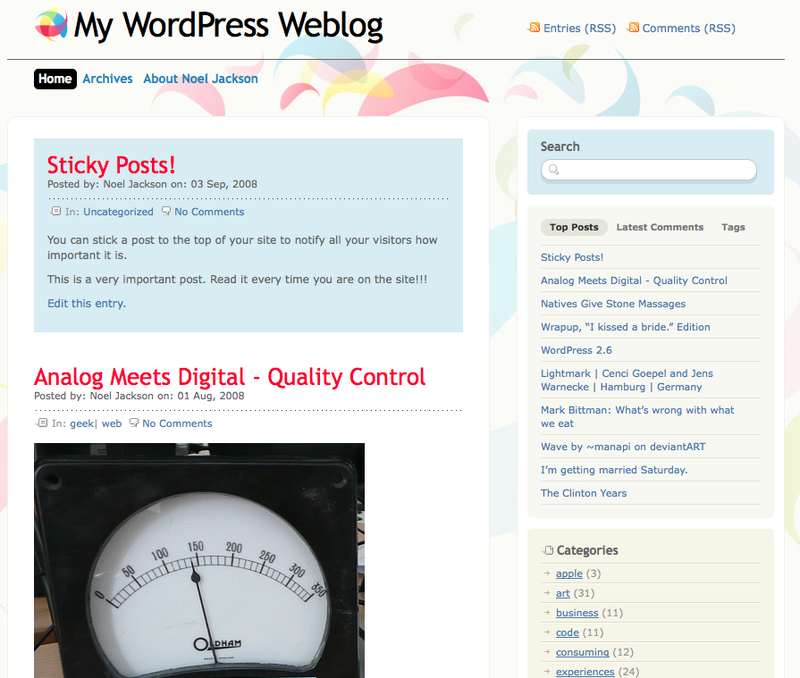 Sticky only changes the front page of the blog. very fun ! i will use it to announce the next videos we’ll post on the WP blog ! Thanks ! Whoa,this is absolutely what us bloggers have been waitin 4! You guys are awesome! Thank you so much for this feature!! That is really cool. That would be a great tool for announcing stuff. Thanks! Super, fantastic, awesome! I’ve been waiting for this!!! Just what I needed — brilliant! I’ve been wanting this feature for a long time now! Thank you!! New feature are being added to WordPress at a better pace. This one seems to be Great !! More Fresh Revelation from WordPress! You did it again! Good job! THANYX! An example of how I am going to use Sticky Posts right away (in the hope of inspiring others to take advantage of this great feature): I review books that often win awards and come back into the news months after I review them. Because people want to read about the books again then, I have been reposting earlier reviews when this happens. Now I can just stick the posts. I am probably going do this within the next 24 hours when the shortlist for a major international book award, the Man Booker Prize, is announced tomorrow. Merci … gracias … vielen dank’! Definitely fantasticky. What a great upgrade. Thanks! This is a fantastic idea! Thank You! thank you , for this facility…. great!! I didn’t know this was coming. Wow!! Thanks, guys! I am sorry, I haven’t read through the previous comments so don’t know if anyone has talked about this issue. But is is possible to tie Sticky posts with stats. For instance, we decide to keep n posts sticky or keep posts with more than x views sticky and the process of making posts sticky or unsticky is left to stats. This can be an added feature to the manual method, of course. Superb, just what I was after! Well now, that’s just so fraccing wonderful, I might have to send you all chocolates and cookies. Seriously. It’s a really great thing to have added for us. Thanks! I’m almost regretting my epic outburst on a similar forum for an earlier update that’s best not discussed. But with the sticky post feature, I stand corrected. Perfect timing! I was wanting to prioritize postings! Wonder if there’ll be a top 1, 2, 3, option…maybe let us keep more than a few at the top of each pages? Maybe just the default could be chronological. Be great to have the option to structure it further. I’ll post it to the forums or feedback form.